SCVHistory.com RN1701 | Newhall Land & Farming Co. Stock Certificate, Issued 1917. The Newhall Land & Farming Co. 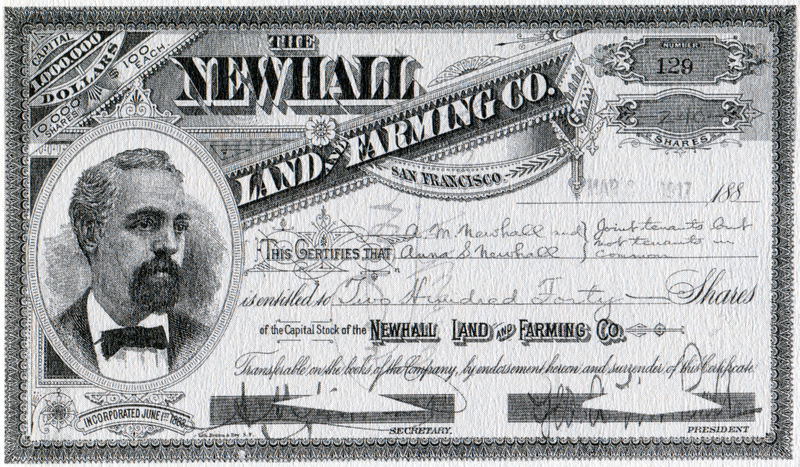 The Newhall Land & Farming Co. stock certificate (240 shares) issued March 3, 1917, to Almer Mayo Newhall (1881-1933) and his wife, Anna Nicholson Scott Newhall (1886-1950), as "joint tenants but not tenants in common." At the time, Almer Mayo was company secretary and his uncle, George Almer Newhall (1862-1929) was company president. Almer Mayo was the son of Edwin White Newhall (1856-1915), the third son of Henry Mayo Newhall (1825-1882). Almer and Anna were the parents of three children including Scott Newhall (1914-1992), editor of the San Francisco Chronicle and Newhall Signal newspapers. Stock certificate illustrated in Ruth Newhall (1992:73), who writes that the design of the certificate was the original version issued July 31, 1883, two months after the incorporation of the company, which was formed by Henry Mayo Newhall's widow and five sons following Henry Mayo's death in 1882. The certificate "remained unchanged until 1941," she writes. "In the upper lefthand corner, it states that the capital was $1 million and the shares had a par value of $100. After November 1932 a sticker was pasted over that corner, changing the shares to no par value." RN1701: 19200 dpi jpeg from book page. EARLY NEWHALL LAND & FARMING CO.